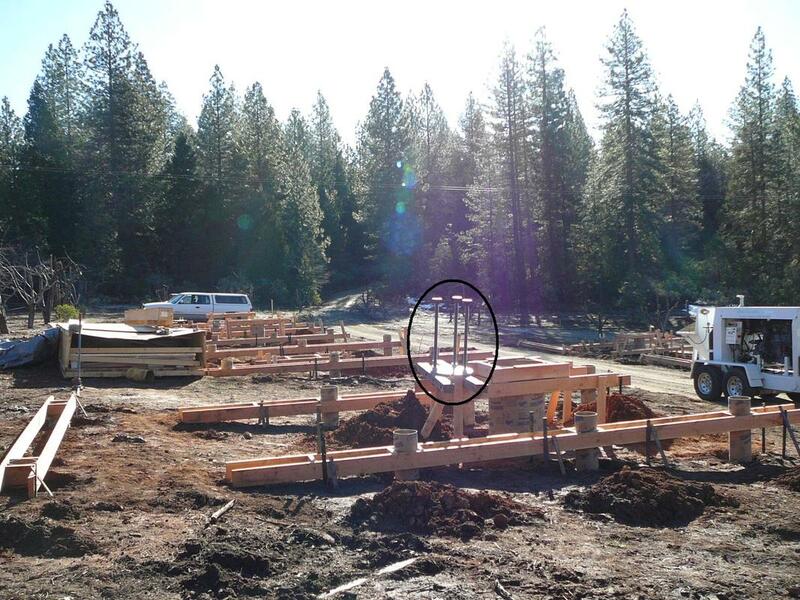 This section describes the construction of the Lost Valley Observatory, as a part of Sierra Remote Observatories (www.sierra-remote.com). 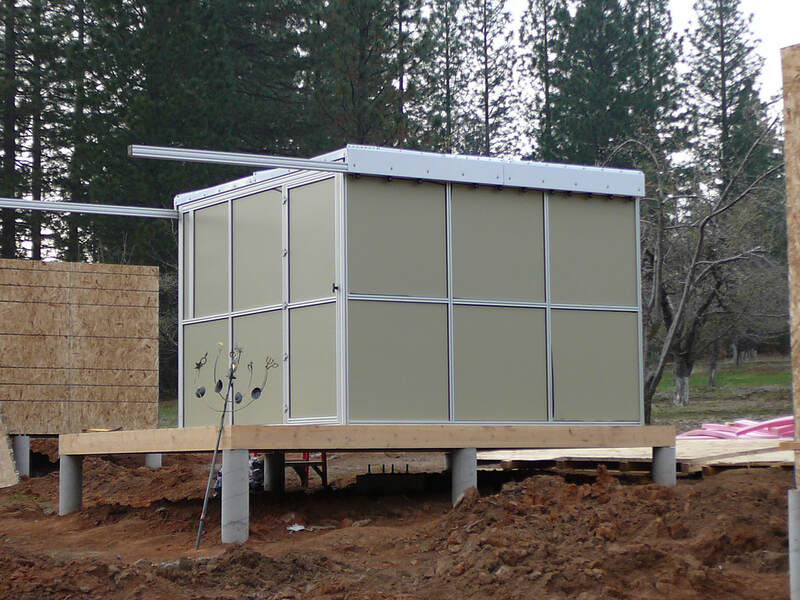 Initially a prefabricated observatory was built, but in 2012 it was replaced with a custom four season designed 10x12 foot building, identical to the other individual observatories built at Sierra Remote Observatories (SRO). Since then I have relocated my telescope (and therefore the Lost Valley Observatory) to one of our multi-telescope roll-off roof observatories at SRO. The most important concept in building this observatory is the site itself. The observatory is located at SRO, an observatory complex at 4600 feet, in an area known for excellent seeing conditions (1 arc-sec summer and 1.2 arc-sec winter seeing), in order to optimize the abilities of the long FL RCOS-16. 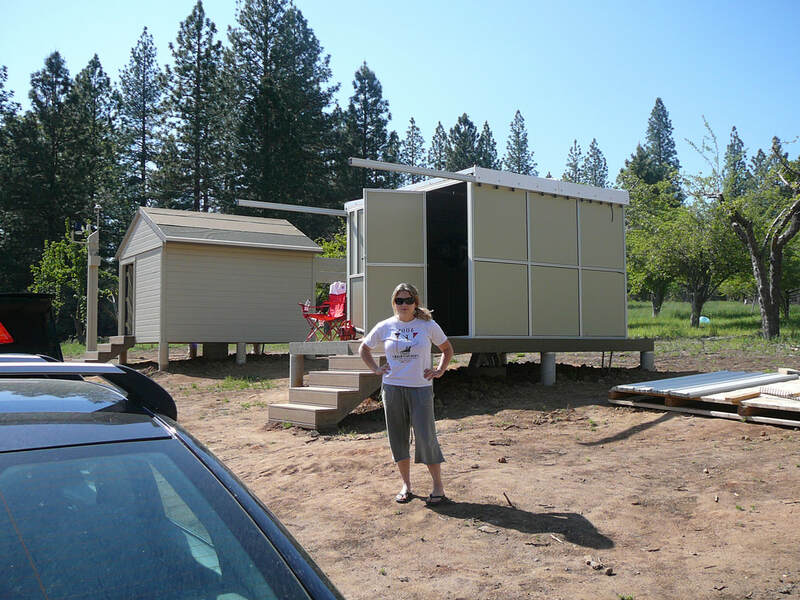 The site is high enough for optimal seeing but also easily accessible, being only 45 minutes from Fresno, CA. 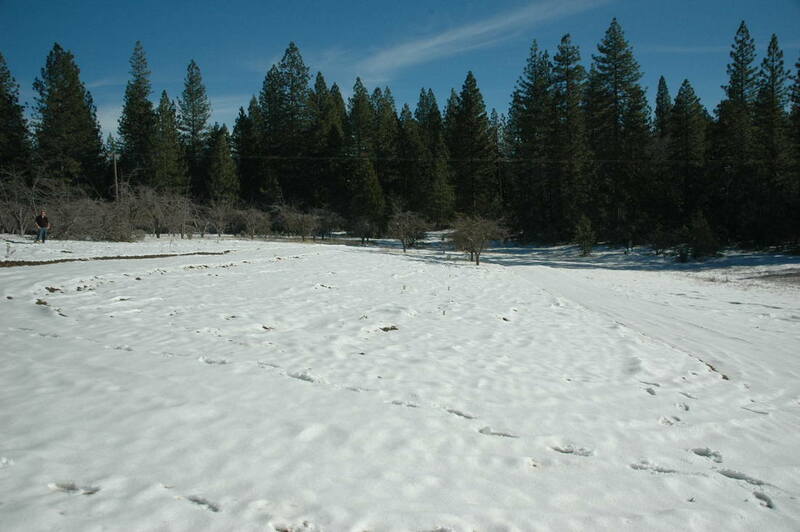 At 4600 feet the snow loads are minimal, making year round access possible. I am on the left of the picture. When the MAS observatory was closed I made a poorly thought out important decision. I kept the RCOS-16 attached to the Paramount ME for transport. The image above shows the RC-16 on it's Paramount ME, sitting behind the Pier-Tech III. 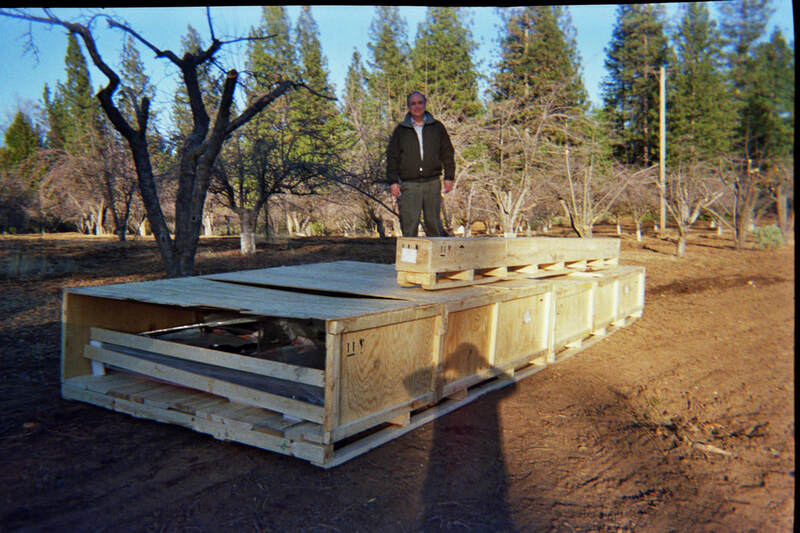 It was transported in a crate across the country, and made it undamaged. It would have been much smarter to dismantle the scope and then transport it, As to why I didn't my answer was that it was just too much work! However, I would not recommend anyone else transport their telescope this way. 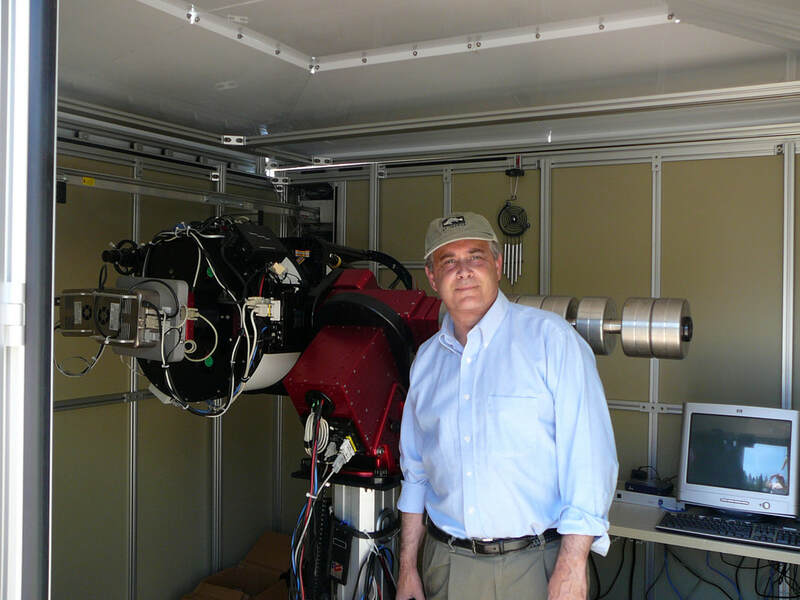 I was very fortunate that the telescope or paramount ME were not damaged. Now this is great. We've got the RCOS-16/Paramount ME up onto the Pier-Tech III, which is on WHEELS. I got the 800 lb rated doly from Lowes and reinforced it. Now I can re-attach all the cameras (and some new gizmos I'll be discussing), test the entire assembly and then roll it into a truck and deleiver it to the "soon to be built" observatory. A bit unorthadox, but definately a great (?) way to get everything working. The gentleman on the right is the 2nd of the 3 founders of SRO, Mel Helm (the other two founders are Greg Morgan and myself). Unlike myself, Mel actually builds his scopes, software and hardware, from the ground up. Now the fun begins. As will be seen I've made a few changes since the scope was in Maine, the main one bing the addition of the AO-L and Don Goldman's "MOAG", an OAG designed to work with the AOL but putting the OAG in FRONT of the filters. More about this later. The image nicely depicts the amount of work which goes into putting something like this back together. I've made a major change in how I will be imaging. The camera is still the SBIG STL-6303. However, since I will be viewing in better skies, I have attached an AO-L, which should improve my "seeing" by about 0.2 to 0.5 arc-sec (according to data from the SBIG site and others I have talked with). 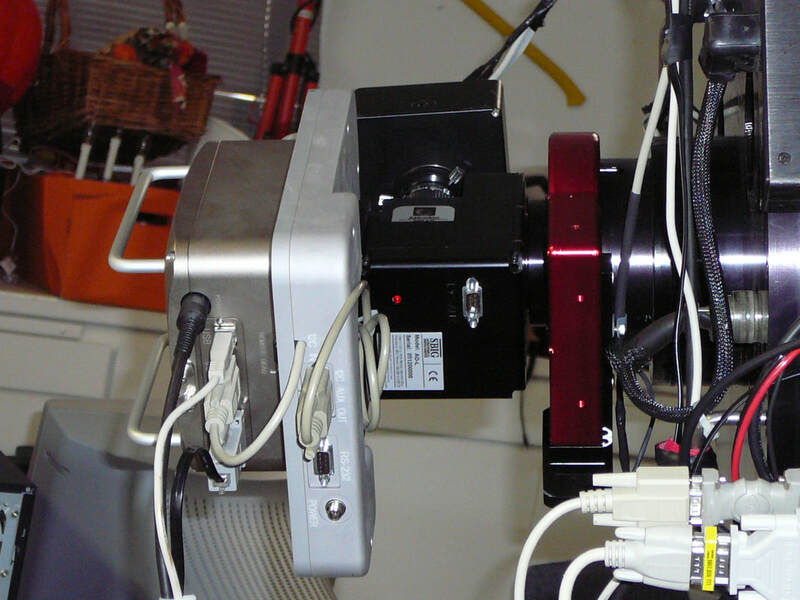 The AO-L will be autoguiding in FRONT of the filters using Don AGoldmans MOAG ( http://www.astrodon.com/ ). The imaging camera will be the remote guiding head. It is NOT an optimal guiding chip, but MUST be used if one is to use the AO-L. Previously I used the SBIG 402-XME, which has an 80% larger chip and higher QE (even at a 3000+ FL I never had to hunt for guide stars). To help make up for this, I've added an custom 2" FL FLR lens in front of the remote guiding head, and have a FOV increase of about 40% (making the FOV similar to the 402XME, with guiding and imaging at different FLs, which, though not theoretically optimal, does not seem to degrade performance based on the experience of others). I have treid to convince SBIG to find a way to use the AO-L with the 402-XME (the ideal guiding camera), but so far no luck (technical issues have made this impossible thus far). For an observatory I chosed the Pier Tech Telestation 2 ( http://www.pier-tech.com/ ). These appear to be well made and I was able to talk Vito (owner and creator) to build one 10 x 10 ft in size (my minimal specifications, allowing for a potentially larger scope in the future and a bit of walk around room). The observatory comes with a roll-off roof which does NOT require rails in the back and comes motorized and with the necessary software to control the roof and, in my case, the Pier Tech III (for raising the telescope). I have always preferred the roll-off roof design for its thermal properties. The only issue is a bit of common sense on the users part (don't close the roof on the telescope !!). 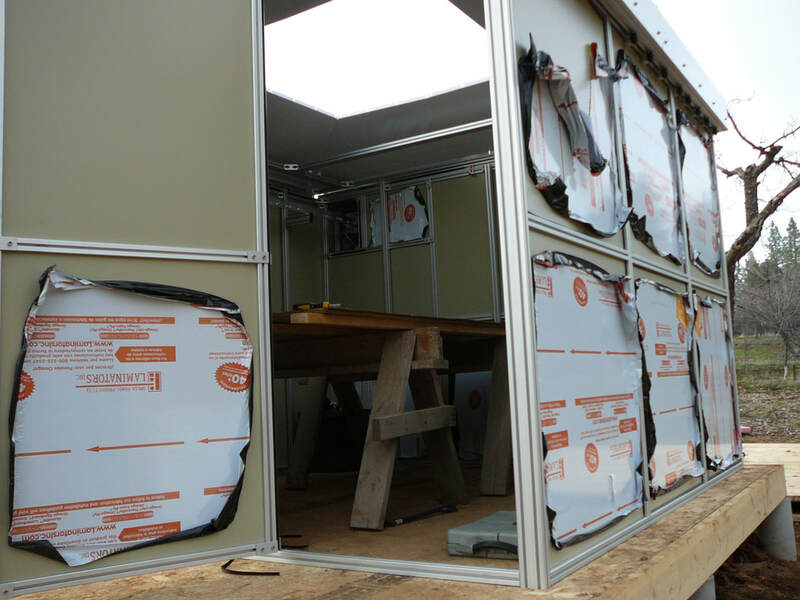 The crates contain the easy to install "kit" (walls and motor installed). 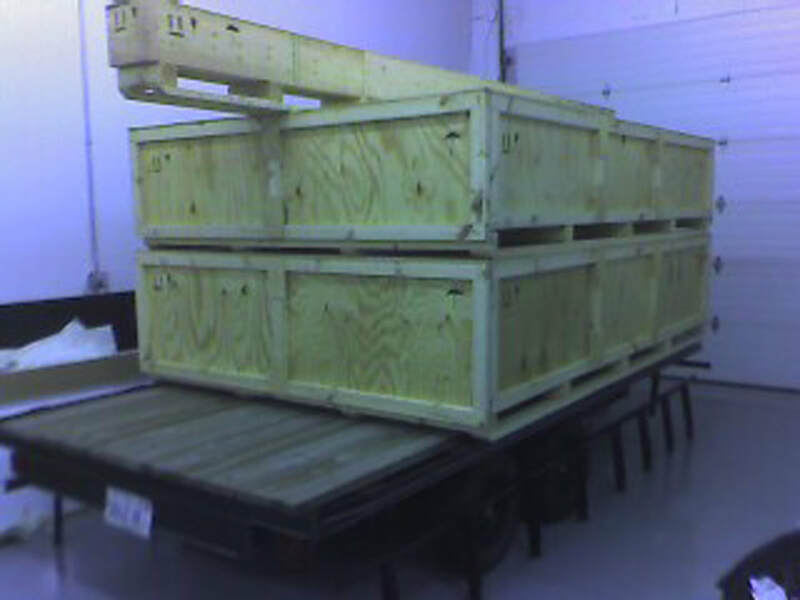 The crates were huge, over 12 x 10 foot and 2 weighed 700 lbs and one weighed 300 lbs. Peeking in the crates, as far as I've gotten so far, the quality appears excellent. As I will describe the observatory, as designed, works well (flawlessly) in three season conditions, but can not handle heavy snow loads (the roof can, and did, invert and collapse onto my telescope in 2008 (no damage done to my increadibly hardy RCOS, fortunately). Evidently Vito is designing a peaked roof option to help avoid this problem. Several months before moving back to California I began talking with 2 avid astrophotographers, Dr. Greg Morgand and Dr. Mel Helm. From those discussions a dream was hatched, "Sierra Remote Observatories". Initially we had hoped to find a spot of clear dark seeing for our own telescopes (which we have done). But the "dream" has grown, with 12 observatoies having been constructed and more construction to come. 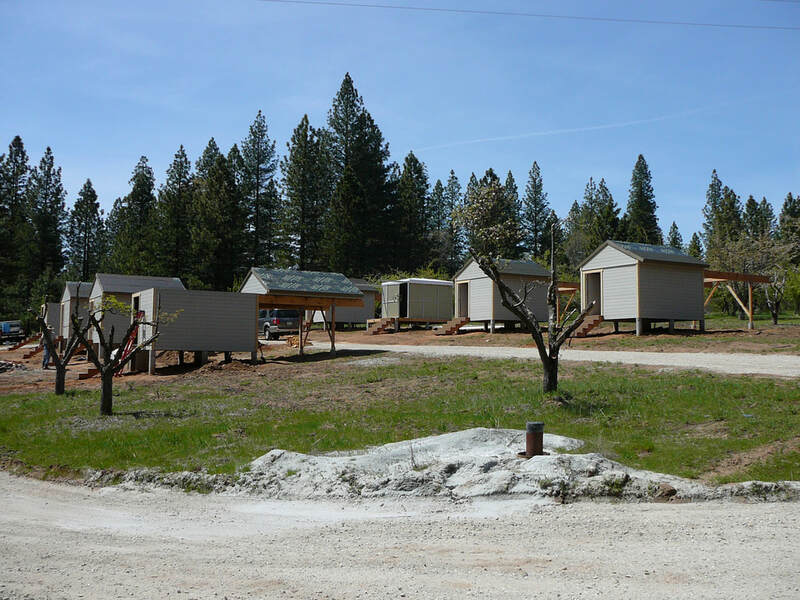 Information about our remote site can be found at www.sierra-remote.com . If you have an interest in remote astrophography in a clear, dark and accessible part of the Sierra Nevada Mountain, this might be of interest to you. At any rate, this is the home for the Lost Valley Observatory. 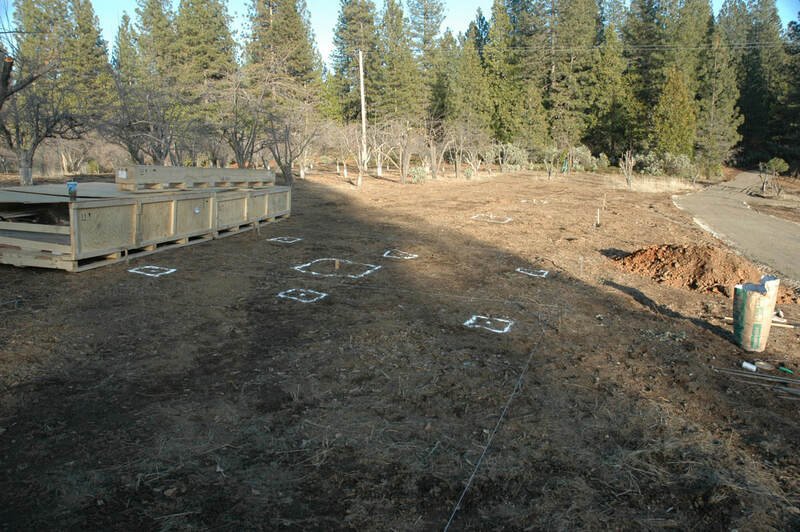 This shows the rough layout for the observatories. Mine (the Lost Valley Observatory) will be the second from the upper left. 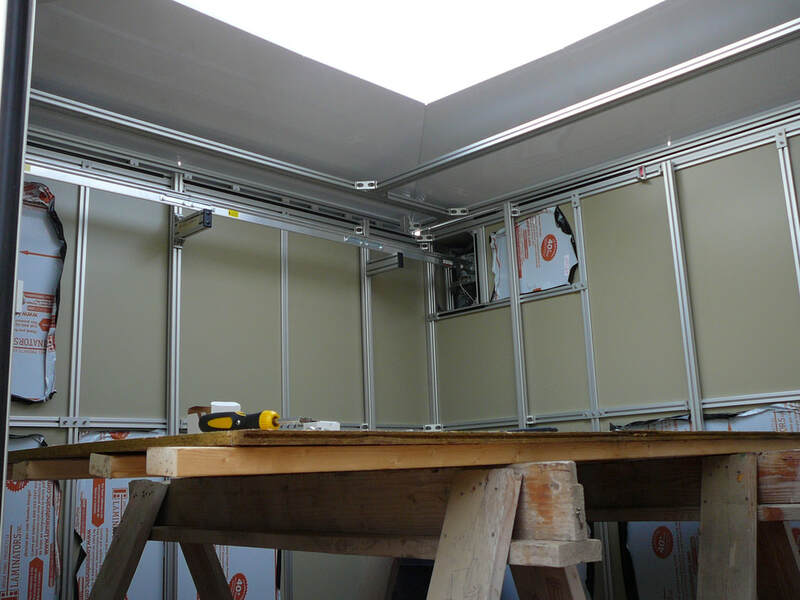 The site has power, T1 internet and the observatories will be roll off roof design. 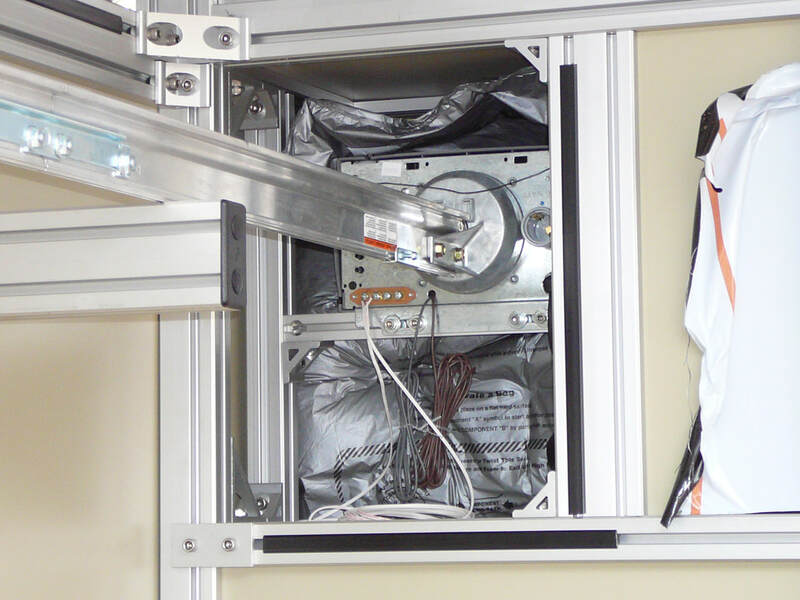 We have created an number of innovative safety features (to prevent the roof from damging the telescope), and will have a real time cloud sensor, seeing monitor (SBIG) and on site web cameras. The site is unique as it is accessable year round, has dark skies with little to no wind, over 300 photometric nights each year and average "seeing" of 1.5 arc seconds (SBIG monitor), with sub arc-second seeing occuring at varying times of the night. 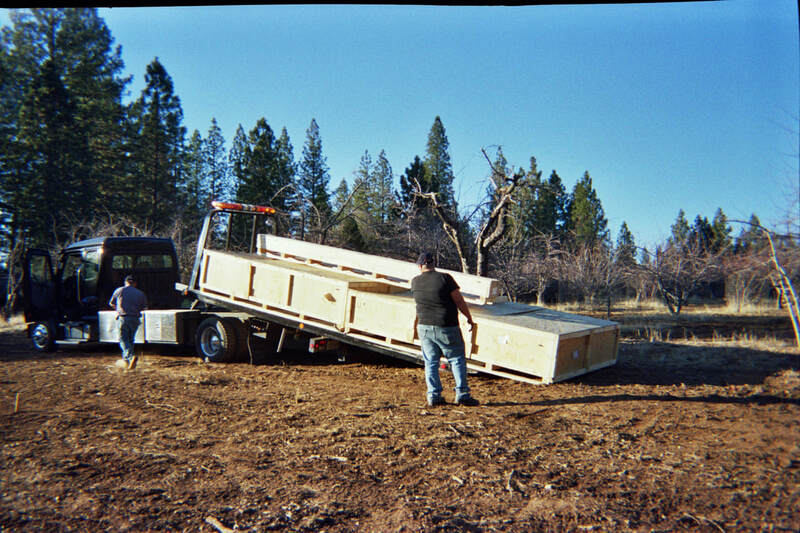 Just for kicks, this was the only way we could get the large crates with the observatory components up to the observatory (future customers will have smaller crates and will have other options). 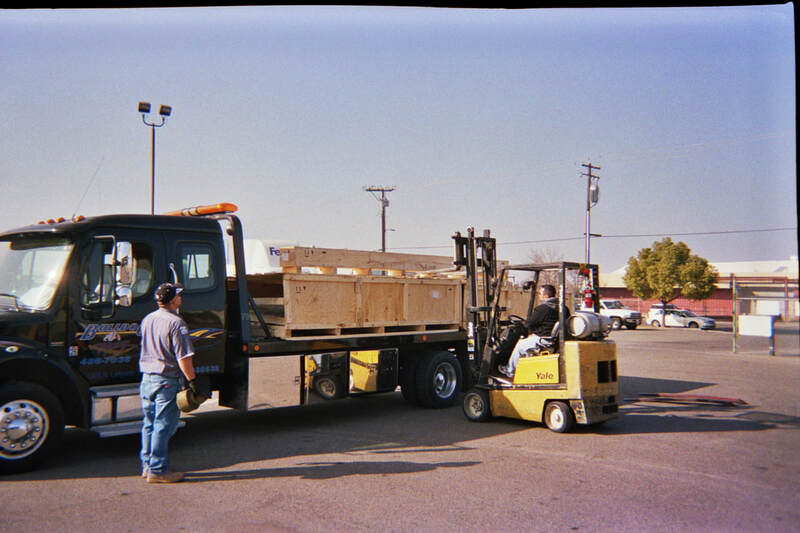 The crates were well built and the plan was to slide them off the end of the tow truck on the other end (2 of them weighed over 700 lbs). The idea worked well. They slid off smoothly. 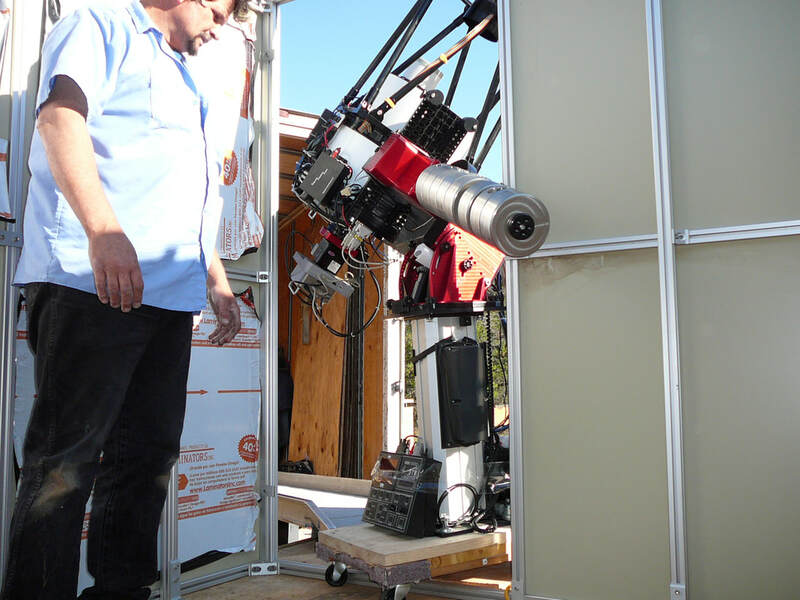 For anyone with a large observatory packed in large crates I'd recommend you keep this method in mind, especially if you don't have a forklift on the other fend of the trip. What else can I say. 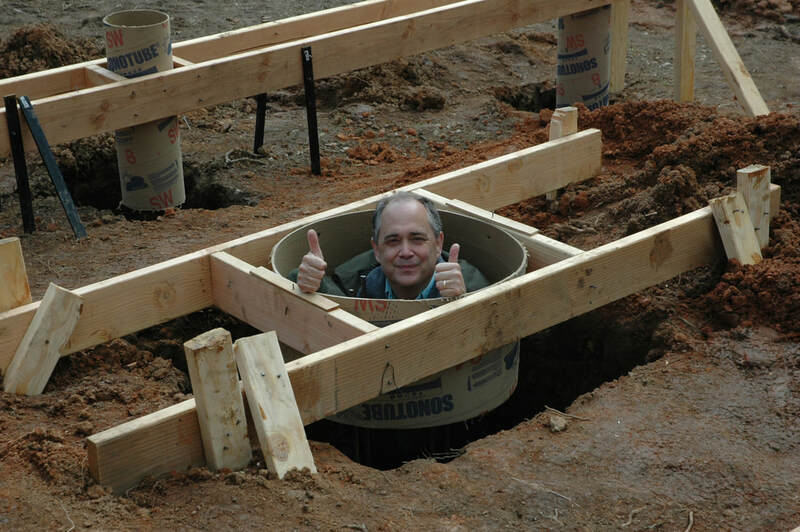 Within 1-2 weeks we will be digging our 4 foot deep holes with, in my case, a 20" Sonotube at the surface. 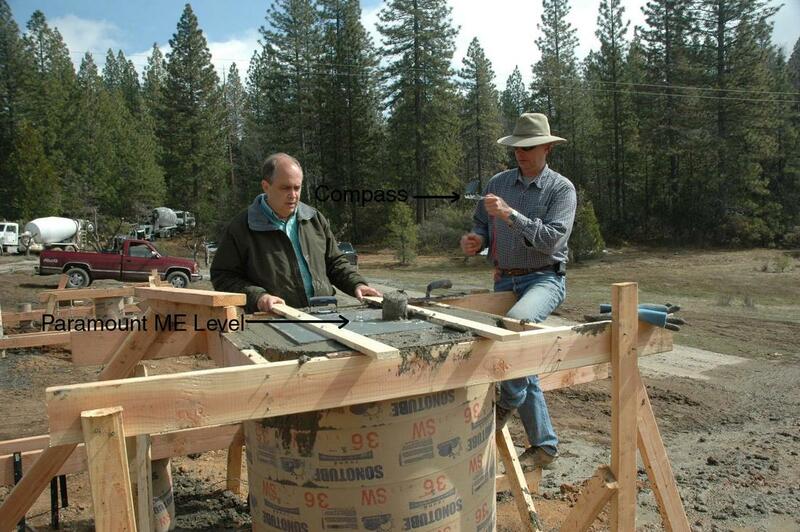 We will use the technique described on my MAS Observatory site (you can find this at: http://www.ourastrogallery.com/observatory/id11.html ) to set the plates in concrete, making sure they are level and pointing to true north. 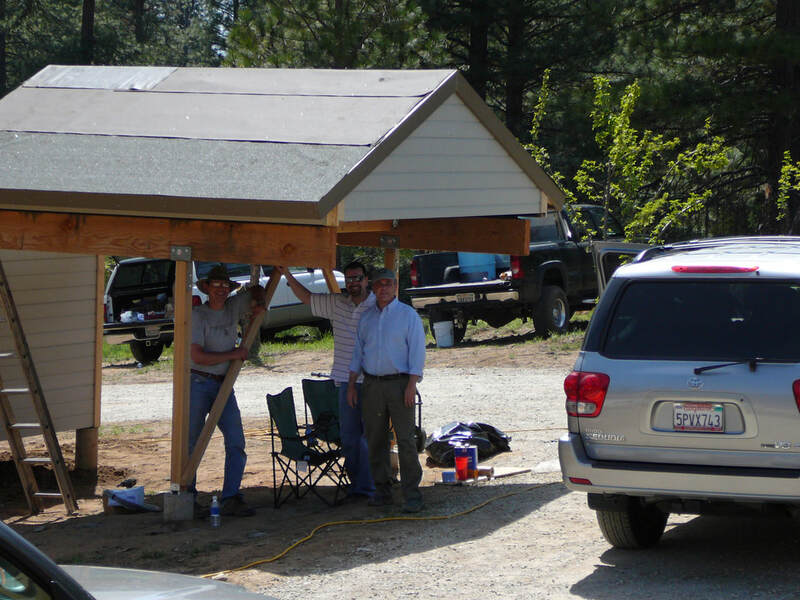 After that we'll build the deck, erect the observatory and put in the first telescope at SRO. You can check out our site or follow along on this site to see what that entails. There will be T1 internet, servers, cloud and seeing monitors with automated roof control, Baytechs in each observatory and a lot of infrastructure to ensure it will all work efficiently. The site for the Lost Valley Observatory has been marked and the sonotube hole will be dug soon. 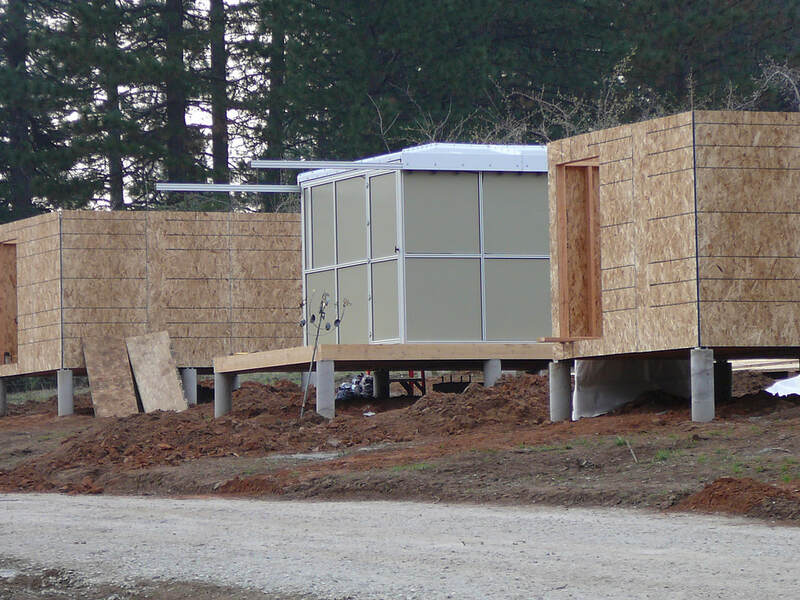 The sonotubes will be poured in a few weeks and the deck put up over shortly therafter. Once this is done the roll-off roof observatory, in the crates in the background of the photo, will be put together (10x10 foot Pier Tech TeleStation II). Also note that the road has been placed (part of it is visible on the right). 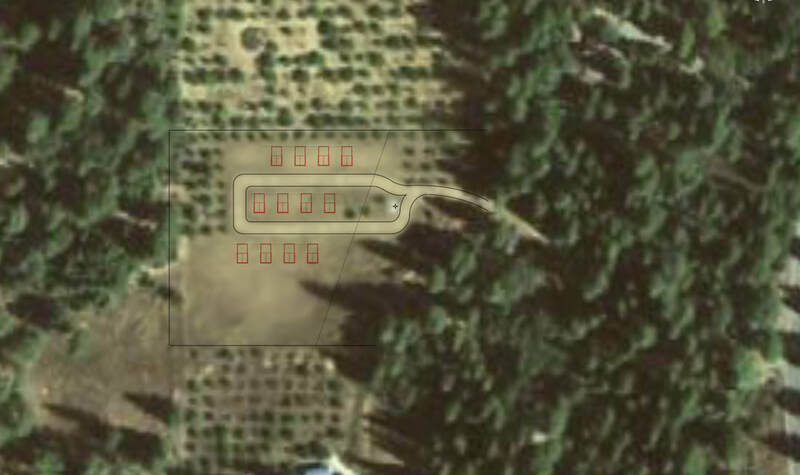 Not visible is the fact that all the internet (T1), catagory 6 and electrical lines have been placed underground. We are making good progress. 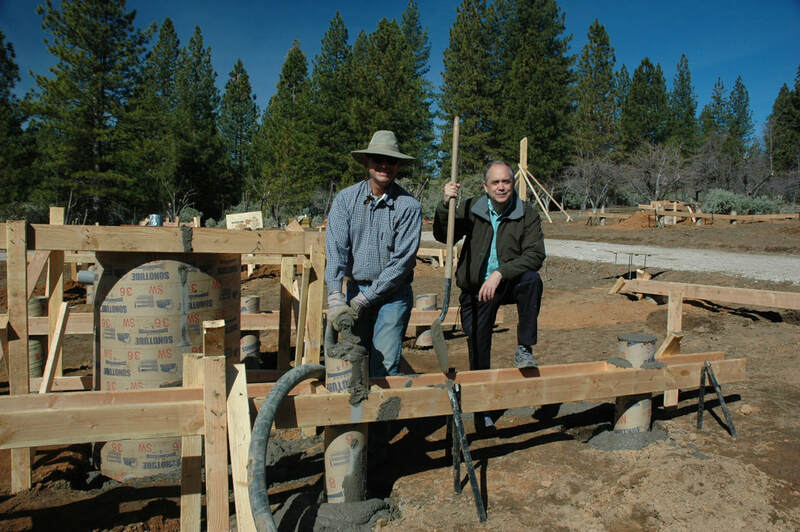 As can bee seen, the foundations and sonotubes are ready for pouring. It will take 3 full trucks to pour the cement. As you'll see, it's quite a job to get this many (10 in all) telescope mounts leveled and pointing north. 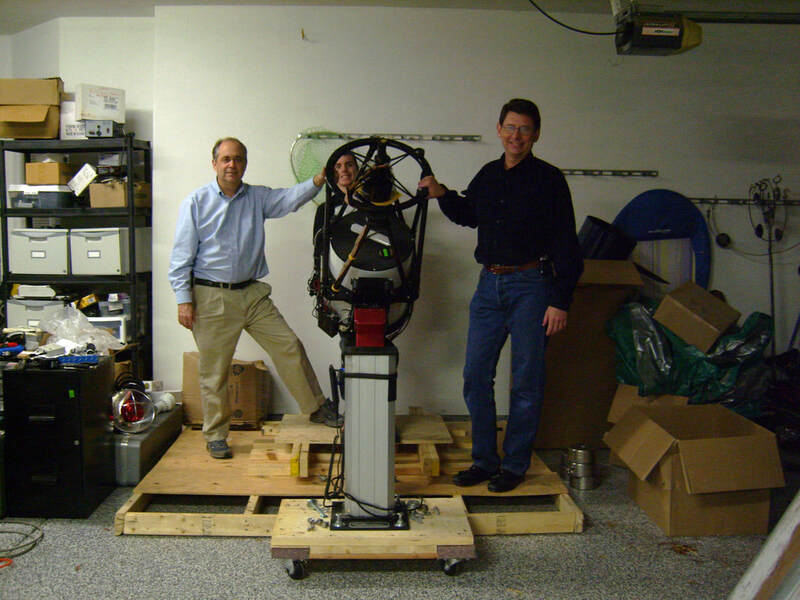 Notice the giant (black circle around it) and very heavy (150 lbs) mount for Mel's scope (one of the 3 founding partners, along with Greg and myself). I can't resist the chance point out that it took three of use to get it in the cement and we had to literally stand on it to force it into the cement. Mel doesn't buy scopes like most of us, he builds them from the ground up, optics, electronics, programming and all. As proof of the brilliance of his mind, note that he was in New York the day we poured the sonotubes !!! We are all waiting anxiously to see his finished product, a corrected Newtonian with an 18" mirror. Unlike my last observatory, these sonotubes are only about 4.5 feet deep, as there is essentially no frost line at 4600 feet in the Sierra Nevada Mountains. Contrast this to the 3 foot frostline at 300 feet in Maine, the site of my last observatory. Just for kicks, the highs at the site of my old observatory was 35 deg F today, comared to 75 deg F at my home (elevation of 400 feet in the low lying foothills) and 65 deg F at the observatory site at 4600 feet (only 40 minutes from my house). The lack of extreme weather conditions, coupled with the laminar air flow should make a significant difference in image quality. The seeing will improve from 3 arc-secs (my site in Maine) to about 1.5 arc-secs at Sierra Remote Observatories, where the Lost Valley Observatory will be located. The key is to be sure the mount is pointed north and is level. This is not always as easy as it may seem. In our location we were able to confirm the compas, taking the difference between true and magnetic north into account, was accurate if held a few feet from the sonotube. 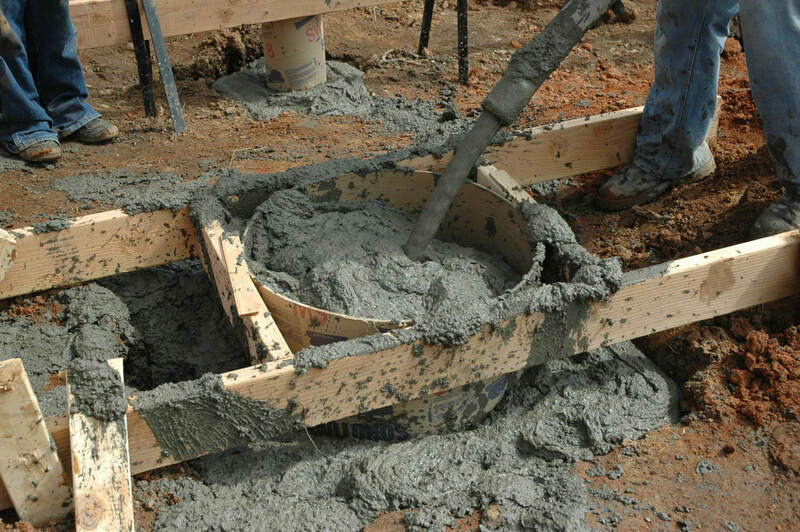 Essentially, as the cement dries it will contort and move the J-hooks of the mount, buried in the cemnet, forcing us to make constant adjustments. In the end we succeeded. As can be seen the first 8 buildings, and the Lost Valley Observatory (the nbeige building), are up (more or less). I will add a great deal of text to these images in the next few days. Needles to say I am thrilled at the workmanship and quality of Vito's "Pier Tech" Telestation II. More on that soon!! 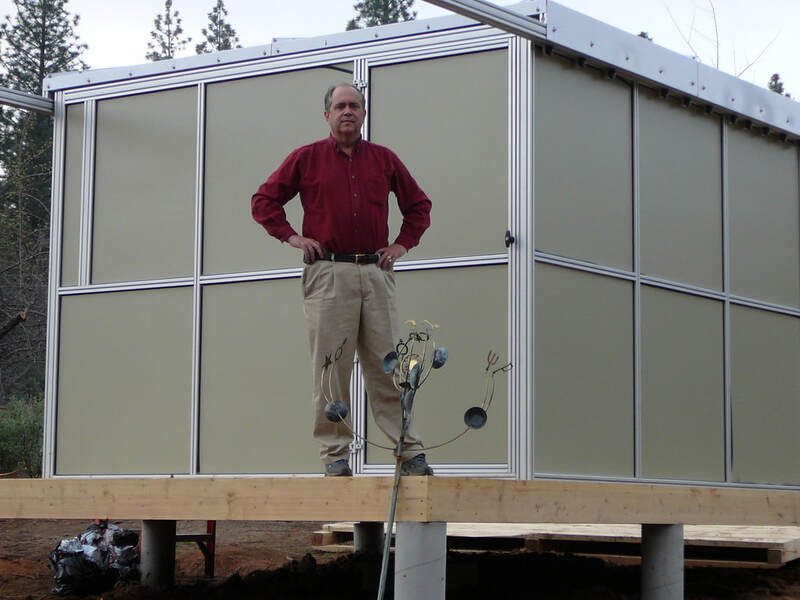 Pier Tech Observatory (custom 10 x 10 foot) built and in place. The product is remarkably well designed, with the exception of snow load characteristics (note the flat roof design). In fairness, it was sold as a three season observatory. 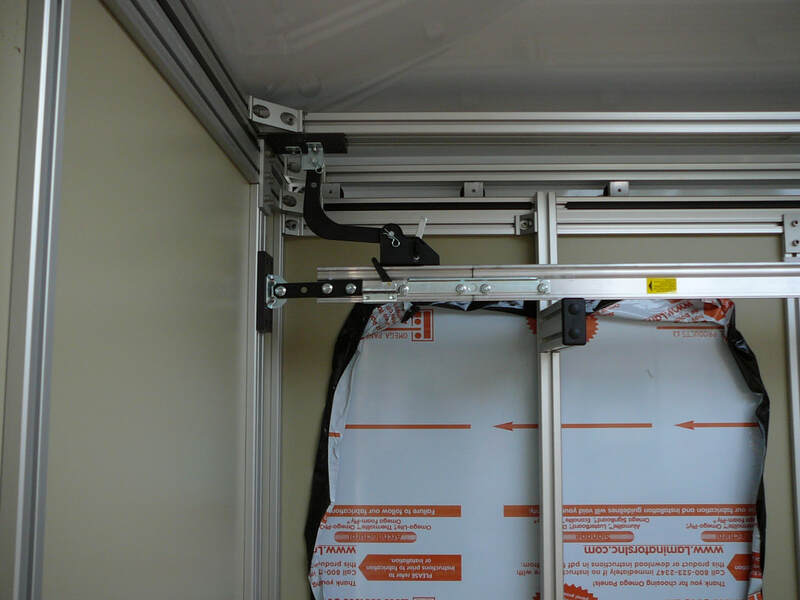 The location of the standard garage door opener can be seen in the corner, with the roof using a standard worm screw design. It has been remarkably trouble free. the stops on either end are mechanical and I will enentually replace then with magnatic switches, which will not be suseptible to snow or ice. Again, this model was designed for three season use. The design has excellent thermal properties, with rapid heat dissapation as the structure is essentially 100% aluminum. The frame is strudy. The weather stripping was a bit problematical (sometimes comming loose), but with a dab of silicone worked well and the new weather stripping works better (the brand was evidently upgraded). I have been happy, extrememly pleased, with the design (with the exception of the snow load issue, which is being addressed). Just a close-up fo the worm drive. I prefer this design to the standard chain drive. It required a bit more engineering (by Vito), but I believe is much more trouble free. The motor is cleverly placed into a watertight compartment which extends out the north end of the observatory, keeping it out of the way of the telescope as it slews out of the observatory. This is a very nice feature, and an example to Vito's attention to details. The door is up and swings outward. This is the best configuration, but in snow be prepared to clear the area! Of course, if it swung inward, it would hit the telescope. SRO in all it's young glory. Eight independant and robotic observatories in unusually good seeing conditions. 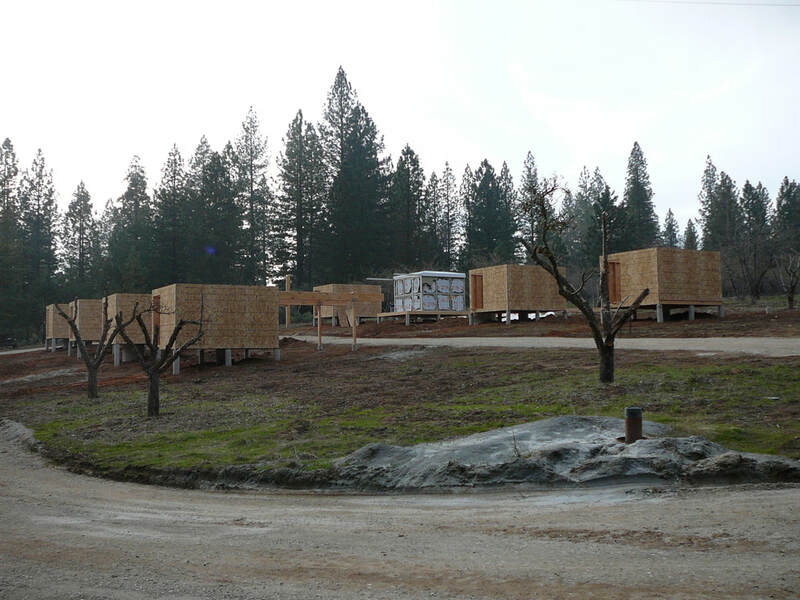 All eight were "taken" long before construction began and it became obvious that we would have to add at least two large observatories if we were to keep up with the demand for space. My favorite SRO picture. From left to right you see Greg Morgan, Mel Helm and myslef, or, as I see us in this image, the Three Amigos! We are standing in the shade of Frank (Sandy) Barnes Observatory. At that time it was shared by Sandy and Steve Mandel. To say the least, we felt just a bit outclassed ! This is not the way I recommend you move your telescope. 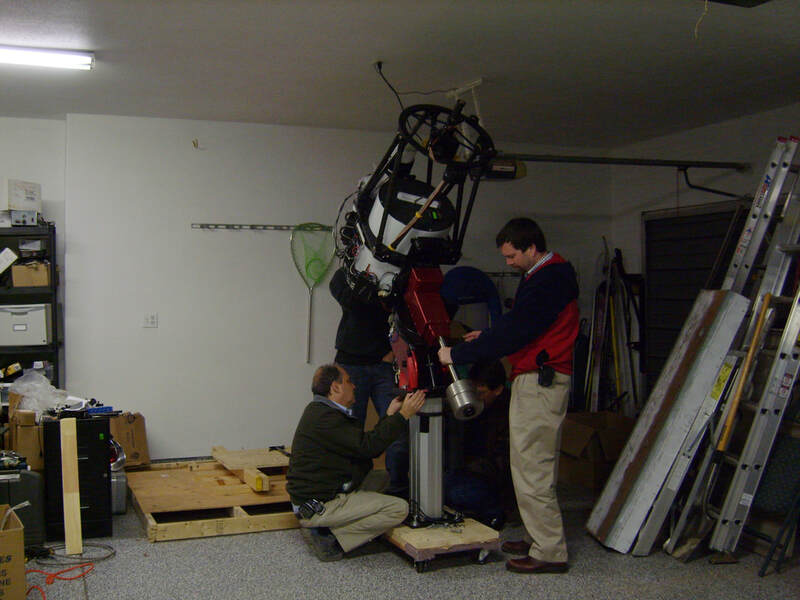 But since I was unwilling to disasseble the telescope, we drove it up to the observatory in a truck. it took considerable force to roll it onto the trcuk on it's Lowe's dolly! On retrospect, betwen the vibrations and risk of damaging it, we were very luck it made it with it's collimation almost still dead on! Just a view of how we rounded the corner of the door and managed to get the entire assembly through Vito's Pier Tech door. We has less than an inch of clearance. 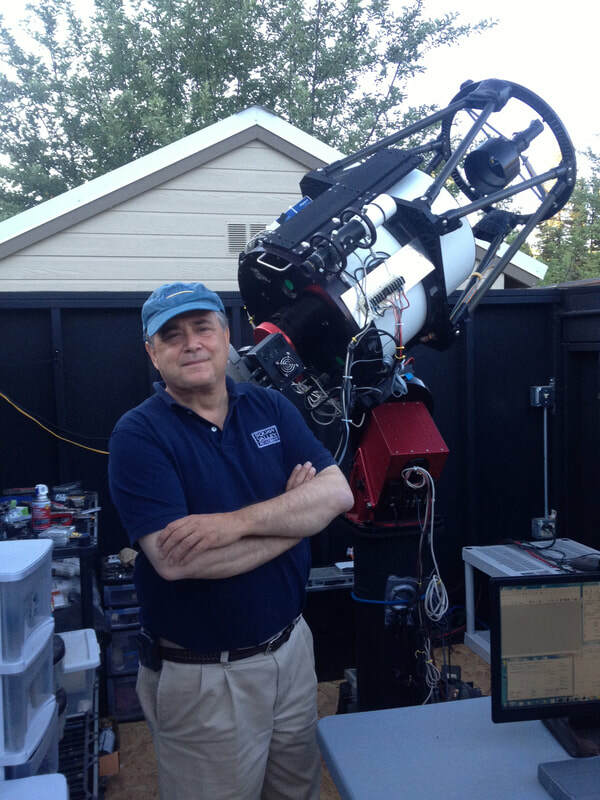 My original setup included 120 pounds of telescope (the 16" RCOS scope and a Takahashi 106 FSQ initially). With the counterweights we had 240 pounds on the Pier-Tech III Telescope Pier. 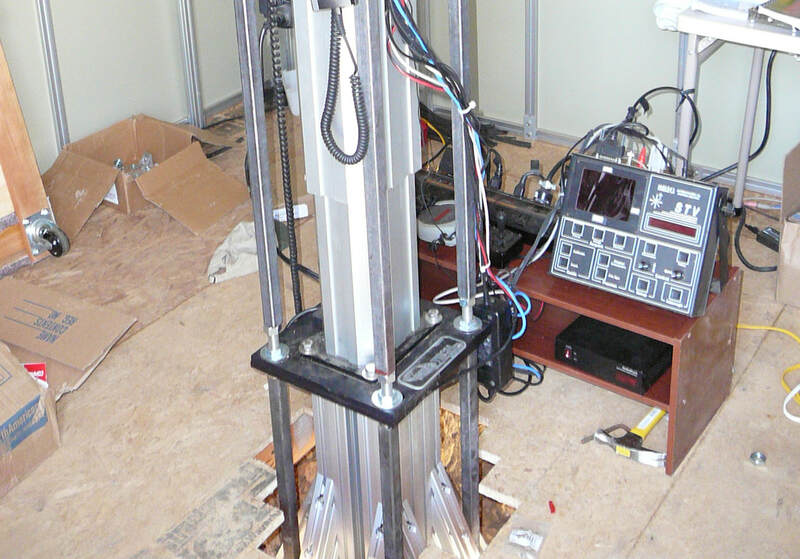 Althought the motor could lift the weight, the construct was unstable and even a good T-point model could not correct the mounts flexure. In fairness to Vito, I doubt anyone ever tested this mount for long focal length autoguiding with this amount of weight, nearly exceeding the abilities even the Paramount ME. The next image details the solution, bracing with hollow steel rods from, you guessed it, Lowe's! The idea from Mel Helm, the mechanical genious of SRO. Here you can clearly see the gray square hollow steel sharfts the reinforced the Paramount ME. 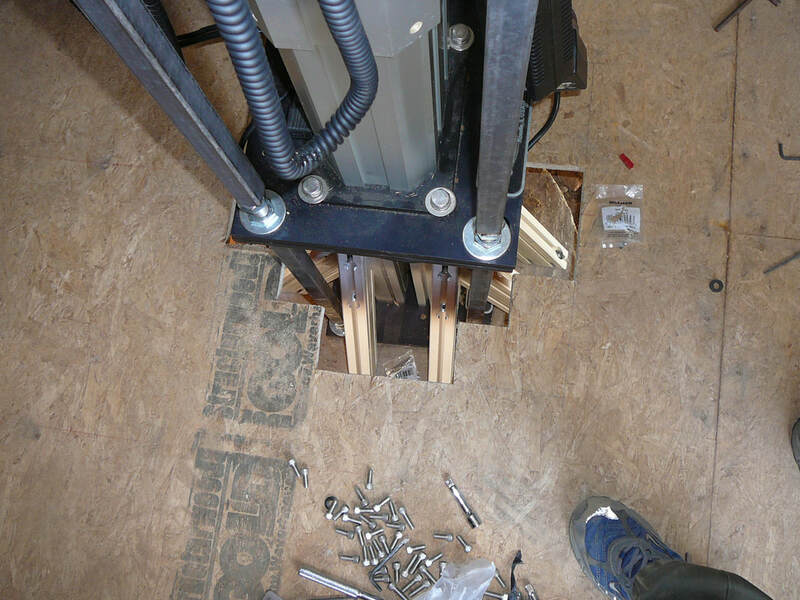 We raised the PT-III and had it settle onto the shafts, then simply unplugged the Pier-tech III Pier. It is no longer posssible to rock the mount, whereas there was about 2-3 inches of movement prior to making this change. With this system I was able to image at a quality greater than I had ever before. Although the Pier-Tech III had to be modified, the platform was solid. The biggest issue I ran into was snow loads overwhelming the observatory, which was not built to handle snow loads. 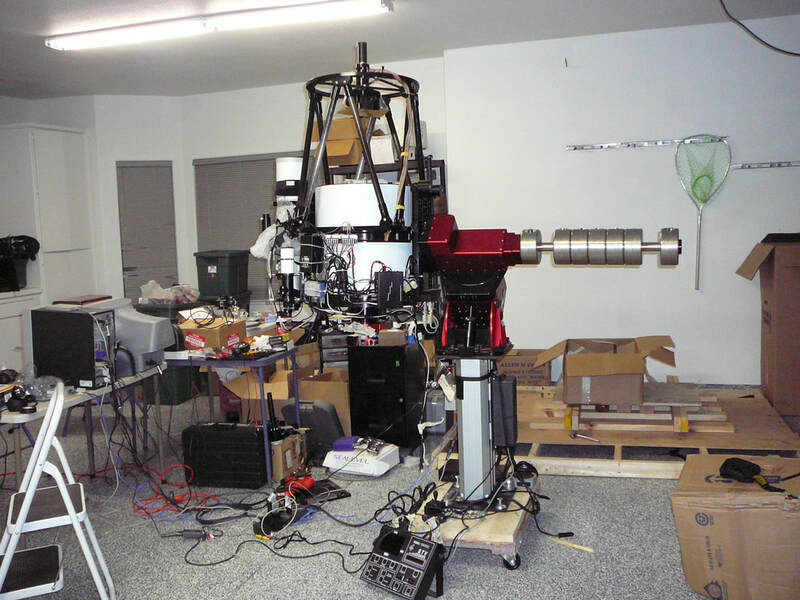 My final solution was to build a cusom observatory and use a solid Pier (similar to those sold by Software Bisque). My system is now in a custom built roll off roof observatory. The Paramount ME is on a solid steel pier.